In school, history was my favorite subject, running a close second to English and writing, of course. When I learned about the Continental Divide of the Americas, or the Great Divide as it's sometimes called, it sounded magical. Combine mountainous with hydrological, and, to a gal raised on the southeast plains of New Mexico, it was exciting. Drop in Bering Strait, Caribbean Sea, Strait of Magellan, Gulf of Mexico with the Arctic, Pacific, and Atlantic oceans and my imagination soared. 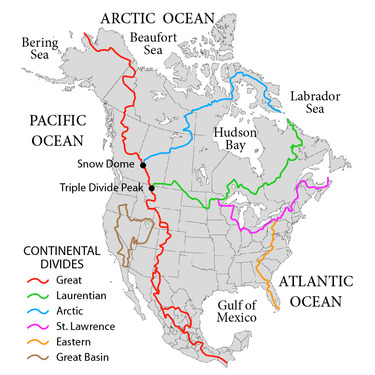 I discovered that there are many other hydrological divides in the Americas, but the Great Divide is the most prominent. It follows a line of peaks along the Rocky Mountains and Andes. Fast forward 54 years and a move to Colorado. We now live in the San Juan Mountains (Southern Mountain region of the state) between Pagosa Springs and Durango. We're also included in the Western Slope region. 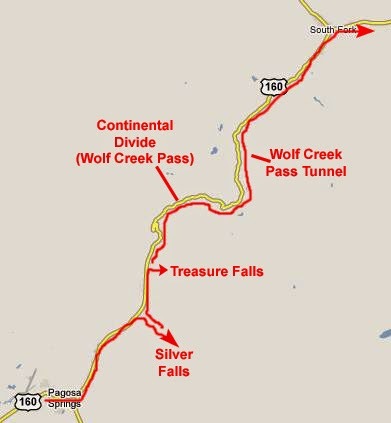 My first trip over Wolf Creek Pass (elevation 10,857) was a red letter day. I had found the Great Divide. I was standing on historical hollowed ground. As I travel around Colorado, I look for information and facts I can use in my writing. Some facts are just fun to know. For example, William Dale Fries, Jr., using his pseudonym C.W. 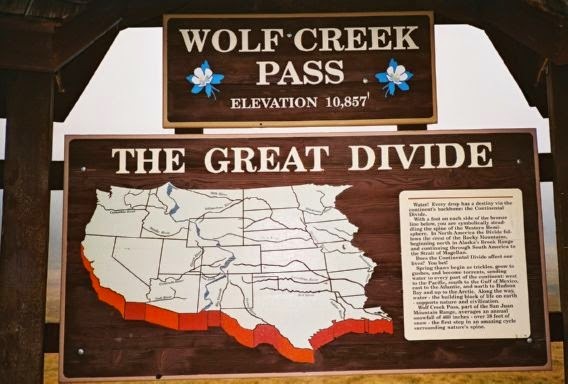 McCall, wrote a song in 1975 inspired by the treacherous Wolf Creek Pass. 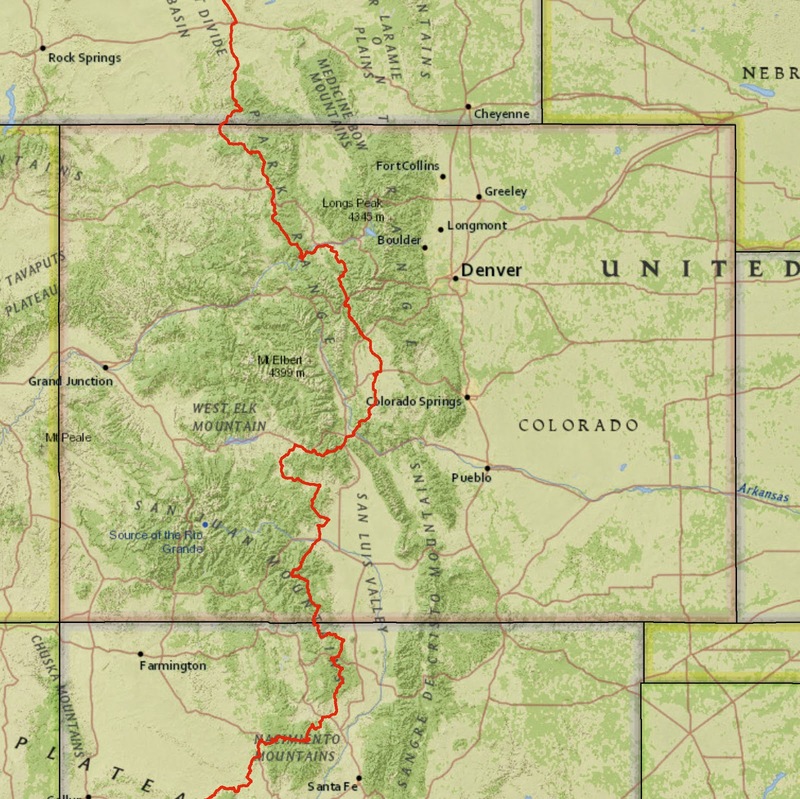 Colorado is one of the most geographically diverse places in the country with several physical regions including the Front Range, Eastern Plains, Northern, Central, and Southern Mountains regions, plus the Western Slope. And, of course, our portion of the Continental Divide. My imagination was fired again when I began researching the Western Slope and its notorious history. 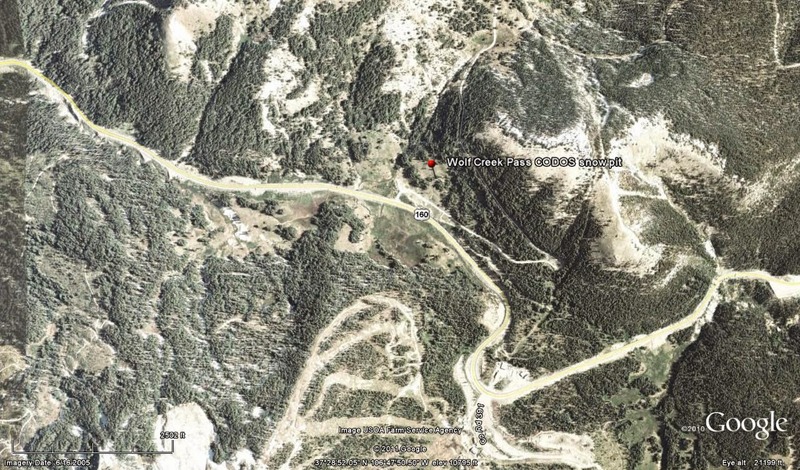 Dotsero, east of Glenwood Canyon, is home to a young volcano. Research says it erupted four millennia ago. Treasure Mountain (elevation 11,908), not far from Pagosa Springs, still waits for someone to discover the lost gold bullion worth about forty million today. I'm a contributor/photographer for Find-A-Grave so I'm interested in old cemeteries and abandoned cemeteries. Many cemeteries just disappear-covered over by blowing sand, moved, or become a site for a new town's buildings. Strange burial customs, like the one in La Posta, fourteen miles south of Durango, also interest me. After a time of singing alabados (songs of praise) during the velorido (watch) the corpse, dressed in night clothes, covered with a cloth, is brought outside on a ladder. Candles are placed on both sides of the body. A bonfire is built, coffee is served, and the deathwatch begins. The next day, the body is buried without a casket, but had a niche carved out that cradled the head. No, I don't know if the ladder was buried with the corpse. Probably not. As I mentioned in my April 27, 2013 CFHS/HHHistory Blog post, Texas had their imported Arabian camels for the military. I discovered that Colorado had P.T. Barnum and his elephants. 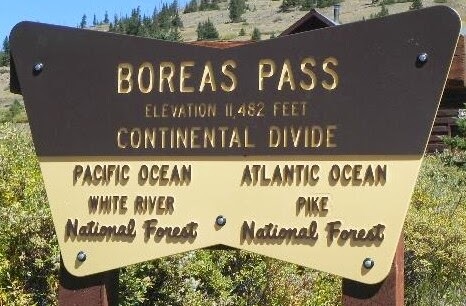 In 1883, Boreas Pass (summit elev. 11,482) was the highest railroad crossing in the world. Grades on both sides were so steep that Denver and South Park Railroad's narrow-gauge High Line was limited to three cars. Barnum and his circus were scheduled to perform in Breckenridge. When the train neared the summit it stalled because of the menagerie weight. The elephants were removed and pressed into service. I'm very partial to miracles and the Scotch Pines flanking the arched shrine with a large marble statue of Christ is a favorite. At the base of Anvil Mountain in Silverton, the trees, not native to Colorado, were not expected to grow in crusty, rock-strewn soil. The seedlings flourished and formed the desired backdrop for the shrine. Now, that may not seem too miraculous if you live in a lush tropical, easy grow area, but silver tailings and mine pollution takes a toll on the soil. Alane Ferguson used Silverton as the setting for her forensic mystery The Christopher Killer. Don't forget that Louis L'Amour lived, wrote, and set some books in Colorado. What have you recently discovered about your state? Lin writes historical fiction set primarily in the 1890s. She enjoys history that is also part of present daily living. She and her husband, Jerry, live on a hay and cattle ranch in Chimney Rock, Colorado. Hi Lin! It was so exciting to read about The Shrine and Anvil Mountain and Silverton. We had a house in Silverton for a number of years and took many a hike and ride to the statue and rode every jeep trail there was. Brings back wonderful memories! Hi Melanie, yes, Silverton is incredible. We see or learn something new every time we go up there. We just got our updated Colorado Trails and have mapped out our 2015 trips. There are so many day trips around here. It's great. Thanks for stopping by. Lin, I visited Colorado one year after the ACFW conference. We went up to the peak of the Continental Divide, and the temperature was in the 50s. The next day a friend and I had to drive over it again, but the temps had dropped, and we had to drive through a blizzard. I have to admit it was a bit scary for this gal from OK. We did a lot of praying. 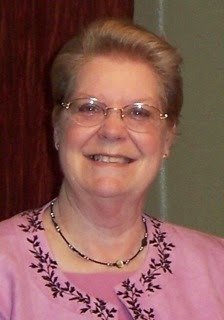 Hi Vickie, rapid and unexpected weather change is the fun part of living in Colorado. Driving home from church, 45 miles away, we'll pass through rain, sleet, hail, and snow, then sunshine when we get home. Now, I know that this happens in many other places, but there's something incredible about it as you move along high mountains, deep valleys, and sharp curves. By the time we get to and from church, we're pretty prayed up too. Hi Sharon, thanks for stopping by. I hope you got a pic with the wooden cowboy statue. The train ride is one of my favorite things. On one trip, we trained up and bussed down. Thankfully, we were on the mountain side of the highway when a really reckless small car with came around the curve in our lane trying to pass a line of cars. The bus driver was calm at the time, but told us later that he was scared. Impact could have slung us across the narrow road into the ravine - straight down. The side of the bus did scrap the mountain side. The third map down is greatly incorrect. 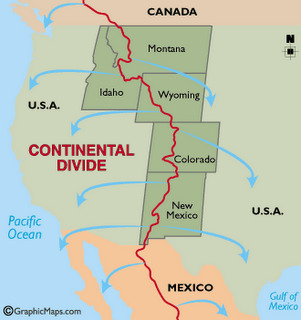 The Continental Divide does not go through South Park as depicted. Rather it goes WEST of Mount Elbert. Please correct.